The thyroid, a gland located at the front of your neck, excretes hormones that regulate metabolism. If you have an underactive thyroid, medically known as hypothyroidism, your body does not excrete enough of these hormones. While medication is the primary mode of treatment for hypothyroidism, diet also plays an important role. In fact, certain foods -- non-fermented soy, cruciferous vegetables and millet, for example -- may not be so good for your thyroid. Consult your doctor before making changes to your diet. Soy milk, tofu, soy burgers and soy oil are examples of non-fermented soy foods. These soy foods are rich in isoflavones, which are plant compounds that have estrogen-like activity. Soy isoflavones are considered goitrogens, or agents that interfere with thyroid function. If you have hypothyroidism, you may need to avoid or limit these foods in your diet. Your doctor can help you determine how much non-fermented soy you can tolerate. 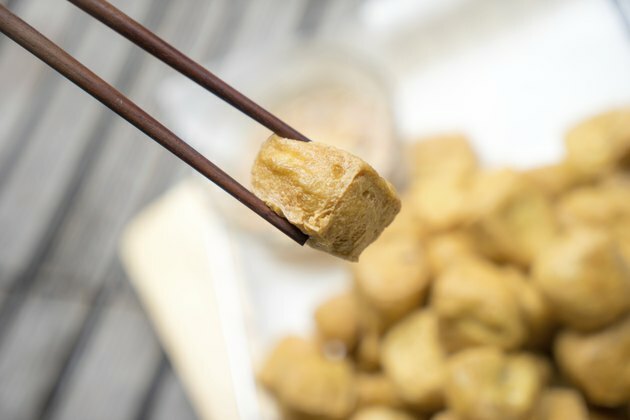 However, fermented soy foods -- such as tempeh, soy sauce and miso -- do not contain the isoflavones and are OK to include in your diet. Raw cruciferous vegetables -- broccoli, brussels sprouts, cabbage and cauliflower -- also contain goitrogens. Eating too many cruciferous vegetables has caused hypothyroidism in animals, according to the Linus Pauling Institute. However, human studies have not produced the same results. Cooking cruciferous vegetables denatures the goitrogens, making them safer to eat. Millet is a nutritious, gluten-free grain used to make cereal and pilaf, and is often added to soups and stews. It is also the grain used to make the Indian flat bread roti. However, millet may suppress thyroid function, according to dietitian Cheryl Harris on the Today's Dietitian website. She recommends that you replace the millet in your diet with other grains. Healthy grain alternatives include brown rice, quinoa or oats. If you search the Internet for foods to avoid with hypothyroidism, you may run across sites that suggest that you eliminate aspartame and gluten from your diet. According to the Cancer Center of America, the artificial sweetener aspartame may cause thyroid inflammation and thyroid auto-antibody production. Gluten -- a protein found in wheat, rye and barley -- may also be a possible goitrogen. However, more research is necessary before formal recommendations for eliminating these types of food from your diet can be made. While it is easy to eliminate aspartame -- found in foods such as diet soda and sugar-free baked goods -- from your diet, you may have a harder time eliminating gluten, which is found in foods such as bread, pasta and cereal. Talk to your doctor before omitting these foods from your diet.